Aspire has been around for years now making some of the industries best vape products and in fact my second starter kit was produced by them the Aspire Premium Kit which I must admit made a huge difference in getting me off the smokes. 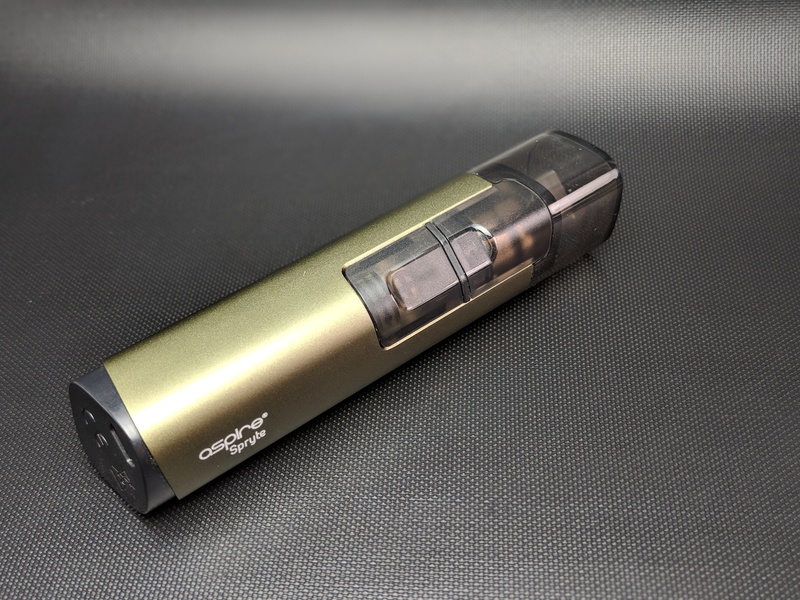 Over the years as things evolved I continued to use various Aspire products and very recently they reached out about a review of one of their latest. Aspire has released several pod mods of late with the Aspire Breeze and the Breeze 2 being among the most popular on the market so I was quite interested to see the kit they sent over was a new and slightly different pod style device. Here are my honest thoughts on the Spryte by Aspire. 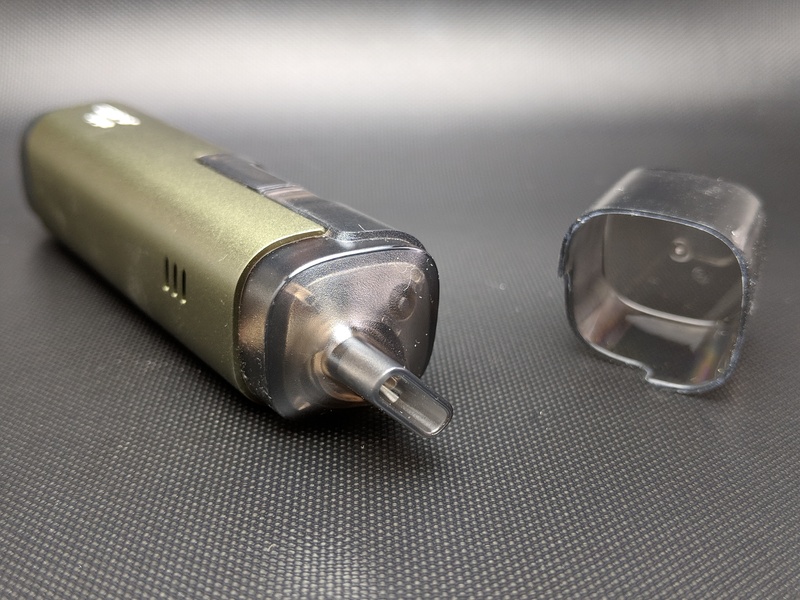 The Spryte’s sleek minimalist design fits well in pocket or purse and the protective top cap fits snugly on to the bottom of the device when in use. 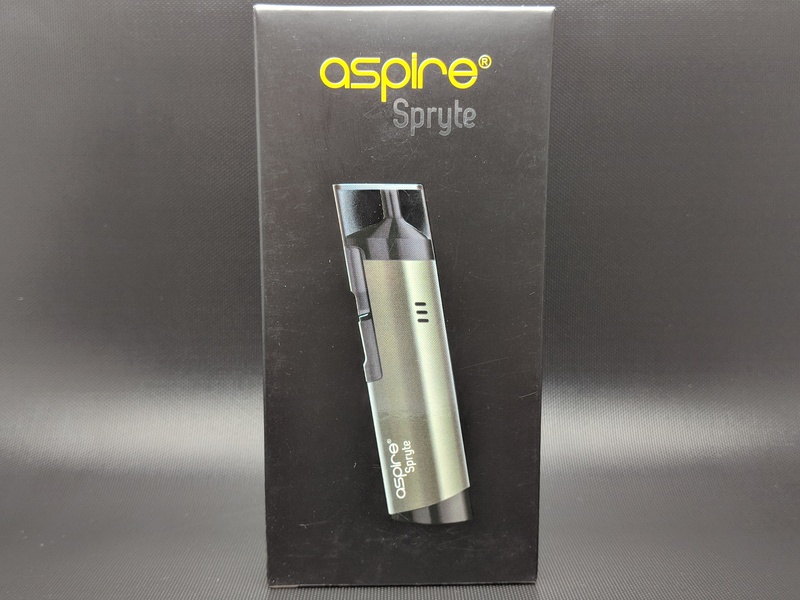 The Aspire Spryte comes packed in a simple black cardboard box with an image of the product on the front while on the back it lists the contents, some basic company info as well as a scratch and check authenticity sticker. It’s pretty modest looking packaging but it did a good job protecting the contents so no complaints about the box. Inside, the device and extras are protected by a plastic shell so it all arrived safe and sound. 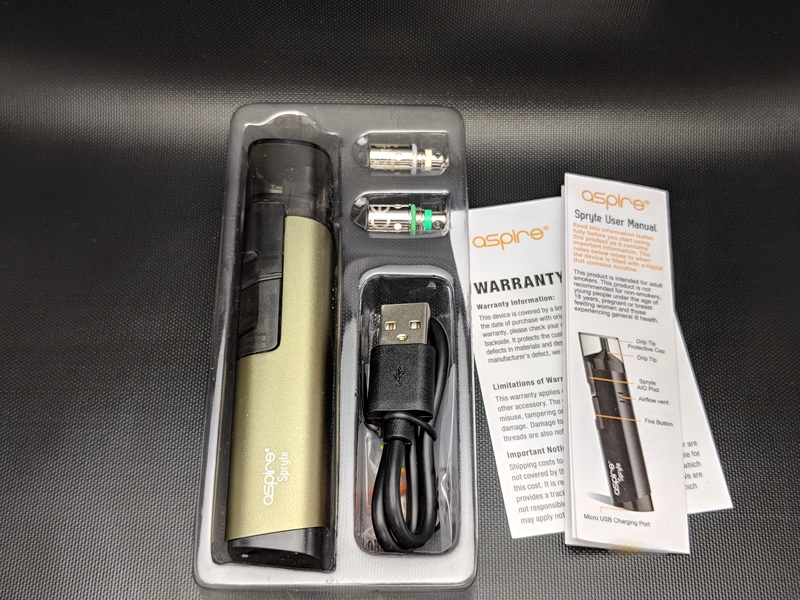 In the kit you get the Aspire Spryte AIO device, two types of BVC coils, a micro USB cable for charging and a bag of spares. In the spares bag you get two black orings and a replacement fill plug for the included pod. The kit also includes a manual and a warranty card. Really not a whole lot of extras or anything but you do get what you need to get started. The device is quite large for a pod device when compared to others in its class but at least it includes some handy features we don’t see on too many others out there. Don’t get me wrong it’s still very pocket friendly but Aspire definitely isn’t going for small and stealthy like many of its competitors with the Spryte. It’s rectangular in shape but the edges are all rounded so it’s quite comfortable to hold. It’s roughly the size of a stick of butter at about 108mm tall and 26mm wide and deep but at least it won’t melt in your hand. 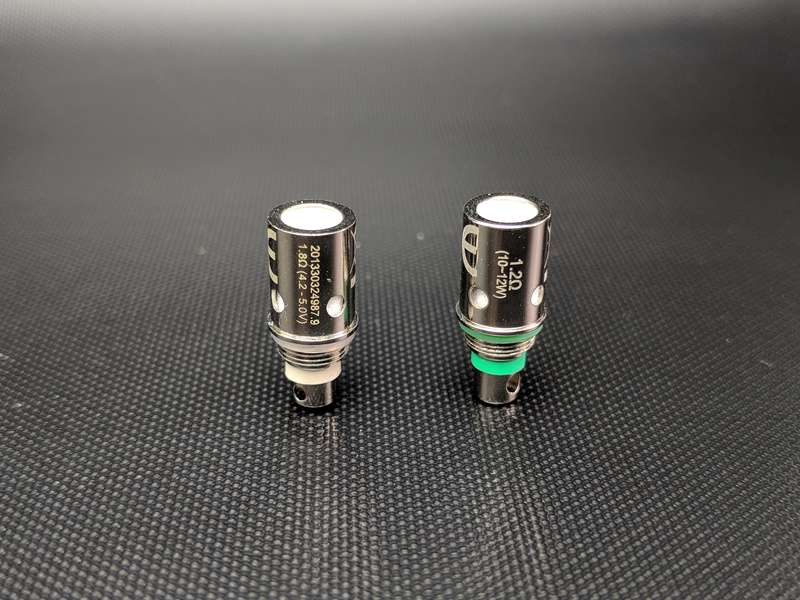 It comes with a clear plastic cap to keep dust and germs out of the mouthpiece that matches the shape of the device and when it’s removed it can be attached to the bottom of the Spryte much like the cap of a pen. The top and bottom of the device are slanted so when it’s sitting on a desk it’s kind of like looking at the Leaning Tower of Pisa. It’s surprisingly stable thanks to the wide flat bottom which also houses the micro USB port for charging up the 650mAh internal battery. Considering the size of this thing I’d have thought they would cram in a much bigger battery as 650mAh seems fairly small in comparison to some other devices in its size category but it does the job and lasts considerably longer then the 350mAh pods that have been popular of late. It’s got a regulated 12w output and appears to be a constant output device meaning the performance won’t deplete as the battery does until the battery is drained and the device cuts out completely. It’s got a single spring loaded button that’s used to turn the device on and off with five clicks and also to fire the device. Unlike the aluminum alloy body of the device the button is clear which allows the LED indicator light to be seen through it. The LED is used to indicate when it’s firing, remaining battery life, as well as when it’s charging. When connected to power it will flash blue and red three times and when fully charged it will flash blue and red twenty times then remain off. When pressing the fire button the colour of the LEDs will indicate the remaining battery charge, Purple is nearly full, blue is about half empty and red is nearly empty. The 3.5ml pod is probably the more interesting aspect of this device. The pod is translucent so you can see the exact level of juice in it from nearly any angle. It uses a push pull system to click in to place on the top of the device. It’s made of PEPG and has an unusual shape especially thanks in part to the shape of the Spryte as the pod conforms to the slanted rectangular shape of the device. The pod is mostly square but angled much like the device with a wide thin drip tip built-in. Think pipe tip and you’ll have an idea of the shape. It’s quite comfortable on the lips but seems a bit big for mouth to lung. At least with this device the airflow is adjustable thanks to a little AFC ring on the underside of the pod but even when full open it’s still fairly restricted thanks to the size of the coils. I’ve been using it about half closed for a nice restricted mouth to lung hit and it’s been great. It’s the underside of the pod that also lets you swap the coils that the pod uses. 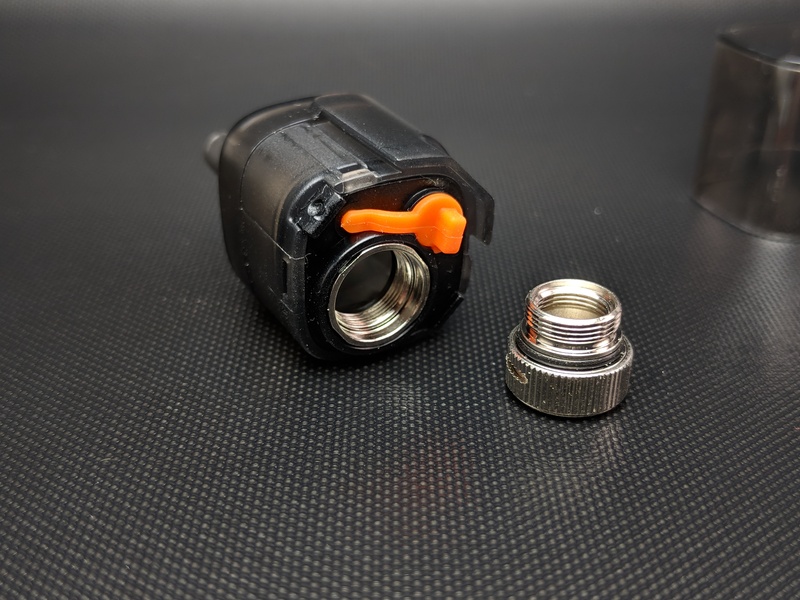 To replace the coil you unscrew the little AFC cap on the bottom of the pod, remove the coil and replace it with one of the spares. If you keep the cap on it will let you stand the pod up upside down which makes the filling and coil replacing process all the more easy. Also on the underside is the fill port which Aspire boasts is 4.6mm wide which should let just about any size tip fit when filling the pod. The kit comes with two coils. Both are Aspires BVC coils but one of them has been re-visited to better handle salt based nicotine. In the kit you get one Aspire BVC 1.8 ohm Coil(Rated for 3V – 5V) and one Aspire BVC 1.2 ohm Coil(Rated 10-12w for Nic salt based liquids). I actually ran both of them using salt based liquids before realizing there was a difference and didn’t see a whole lot of difference in performance between the two. I can safely say they’ll both handle high nicotine liquids and in particular salt based liquids quite well. The 1.8ohm coil should also handle regular liquids but I didn’t really have anything above a 6mg to test with. I’ve been using the device for the past few weeks and although it hasn’t really been used as a daily driver it’s been going out with me as a secondary device and the coil life appears to be on par with most others out there and I was able to get just shy of two weeks on the first coil and I’m about a week and a half in to the second coil. Of course mileage will vary depending on juices used, personal vaping habits as well as QC on the coils but I don’t see why anyone shouldn’t be able to get at least a week and a half or more out of a single coil. Flavour has been great and vapour production is about what you’d expect from small high resistance coils like these but it definitely puts out a comfortable amount of vapour and probably a bit more then we see from other smaller pod devices. Although it is one of the bigger pod devices I’ve used it actually fits quite well in the hand and pocket and is very comfortable to use. Considering the performance I’ve gotten from it I’ve been picking it up to go out with me more often then some of the smaller pods I tend to keep in my pockets. The capacity and battery life are probably the biggest advantages with this kit and for me at least it tends to mean the difference between a companion on a quick trip and an all day device. With the included ability to swap coils this thing should be an excellent choice as either a starter kit or a spare device for more experienced vapers just looking to dabble with higher nicotine liquids or nic salts.